The Men’s Marathon in Beijing was, to be blunt, brutal. In temperatures at least 10 degrees higher than we typically see in the Major Marathon Series, the Kenyans and Ethiopians decided that they were going to run it like a paced race anyway. In an incredible display of front running, the Africans shattered the Olympic record (2:09:21 from 1984) by almost 3 minutes, with Sammy Wanjiru, the world half marathon record holder, claiming gold in 2:06:32. 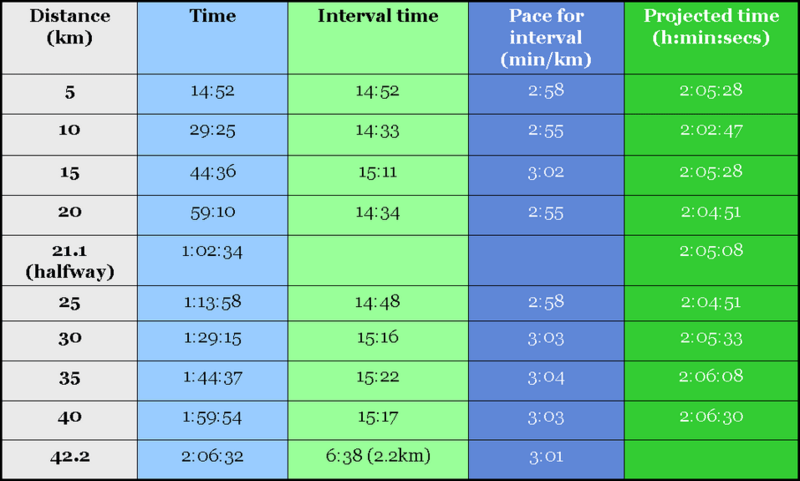 The table and graph below summarize the splits and pacing during the race. The set off at WORLD RECORD pace for the first 10km, running through 10km in 29:25, which is not supposed to happen in a championship marathon, especially when the conditions are supposedly not conducive to fast racing. The field was shell-shocked when the Kenyans, led by pre-race favourites Martin Lel and Sammy Wanjiru, took the lead and reeled off kilometer after kilometer of sub 3:00 kilometers. The group was blown apart, and by 10km, there were only about 10 men at the front of the field. Ryan Hall, one of the pre-race favourites from the USA was not one of them – in fact, he was dropped off before 5km, perhaps a deliberate pacing strategy, as he went on to finish in 10th place. Not surprisingly, it was the Africans who did the running, and the last European challenger was Martinez of Spain, who was gone at about 15km. From 10km to 15km, the pace visibly slowed, which allowed a number of athletes to rejoin the lead group after being dropped by the spectacular early pace. However, the Kenyans clearly decided that this would not do, and Wanjiru threw in an aggressive attack at 16km, which split the lead group for good. It left the Africans to sort out the medals over the second half of the race. Given the searing early pace, second half surges were not dramatic – it was more a case of slight, subtle changes in pace doing a great deal of damage, because the race became so attritional. So rather than attacks, it was a “survive until you die” second half. From 25km onwards, the pace dropped somewhat, but by then the damage had been done. 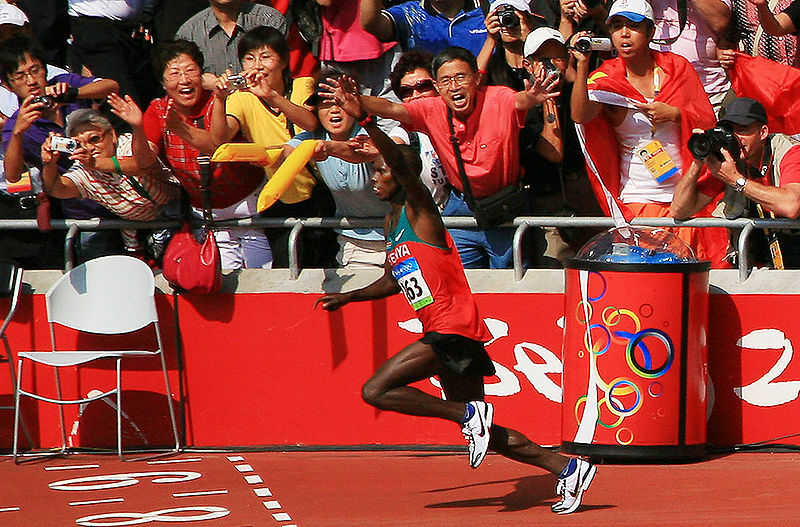 Deriba Merga of Ethiopia took the reigns as the most aggressive runner between about 25km and 30km. He attacked on repeated occasions, helped by Yonas Kifle of Eritrea, and their moves seemed to be putting Jouaid Gharib of Morocco into trouble, while Wanjiru and Martin Lel were able to track every attack. Surprisingly, however, Lel was dropped by a Merga move at about the 29km mark. Many people’s favourite for the race, Lel was perhaps a victim of his own aggressive front running, because he was gapped by over a minute in no time at all, falling back to fifth place. He would go on to finish in fifth, after consolidating and settling down to a more consistent, slower pace, but it was something of a surprise that he lost contact so early. 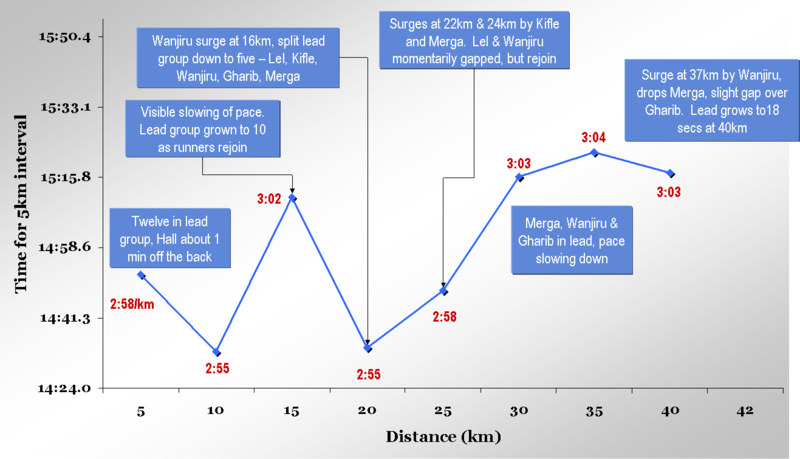 The Merga attacks left three in the front – Merga, Wanjiru and Gharib, who was yo-yoing on and off the group every time there was a slight surge. At this stage, surges were very subtle – no one was blasting 2:50 per kilometer pace – it was more attritional than this. Wanjiru looked easily the most relaxed in the group. At about 37km, he made what was the race’s decisive move. He went to the front, threw in a fierce kick that lasted perhaps 100m, but it was enough to end Merga’s challenge. Gharib was able to pass Merga for second, but Wanjiru grew his lead consistently. He opened up 18 seconds between 37km and 40km, and was never going to be challenged. Merga, meanwhile, blew spectacularly – having been in contact at 37km, he was 2:00 down at 40km, losing 40 seconds per kilometer at 3:00/km pace. Unfortunately for him, that blowout meant that he was going to be reeled in by Tsegay Kebede, his fast-finishing Ethiopian countryman, for the bronze. But Wanjiru was the man of the day – a 21 year old, running in only his 3rd marathon, took the Olympic field and simply ran them off his heels. It was insane running, he set off at a pace that everyone must have thought was completely suicidal. And of course, he did slow down, as the graph shows, but his “slow” was still 2:07 pace, and he was just remarkable. And so with that, Wanjiru becomes the first Kenyan to win Olympic gold at the marathon, which is amazing, considering their dominance of the big city marathons. Perhaps this was the motivation behind the aggressive tactics they adopted. Ryan Hall described the pace as “insane”, which it was. But it was not suicidal, it was a statement of intent right from the start, and no one was able to match Wanjiru. Wanjiru’s performance and overall time made a complete mockery of the pre-race speculation about pollution, heat and humidity. The pollution has done nothing to the athletes in Beijing, though they have been lucky with some rain and weather that has reduced its levels, apparently. As for the heat, the women got lucky with a rainy day, and for the men, it was apparently not as humid as was predicted. However, apart from Wanjiru, the conditions defined the race, and I dare say that Martin Lel came unstuck thanks to the heat and the tactic of fast running early. Then again, so did everyone else, as we’ll show shortly. First, it’s amazing to consider how these elite runners defy the normal physiological “logic”. People so often freak out over the risk of heat-stroke and dehydration, and then the world’s elite come out and run sub-3:00 per kilometers in conditions that the ‘expert’ scientists tell us is dangerous. If anything, it should be a lesson on how remarkable the human body is, and a telling statement that when everyone warns you that your life is in danger when it’s warm, they’re reacting to marketing, not science. Last year, the Chicago Marathon was run on a warm day (similar to Beijing, I’d guess) and the sports doctors were telling the world how dangerous it was after many athletes failed to tolerate the heat. We wrote an article at the time that heat-stroke was almost a physiological impossibility, and the only impact on athletes is that they feel much worse running their normal pace, and therefore slow down. Today, the elite athletes showed just how remarkable physiology really is. They were slowed by the heat, and maybe 2 minutes’ improvement can be expected on an ideal day. The impact of the heat on the Beijing race? To appreciate just how the heat impacted the race pacing, consider that only ONE athlete in the race was able to run a negative split. That was Ruggero Pertile of Italy, who did a 67:17 – 66:36 split to finish 15th. Of the men in the top 10 (who chose to run the incredible early pace and covered the first half in 65 min or faster), it was Wanjiru who came closest – he did a 62:34 followed by a 63:58 (a + 1:24 difference). The rest of the top 10 had an average first half of 63:16 and an average second half of 67:19. The average difference was therefore + 4:03, which is a huge positive split across for 2nd to 10th. Considering that most of the top 10 are sub 2:07 runners (and thus “comfortable” at 63:12 pace), you can see how the heat impacted the performance. That was ultimately the difference – Wanjiru’s relative ability to sustain the pace in the heat (it’s also worth nothing that 1st, 3rd and 4th where three of the smallest men in the field – the smaller you are, the cooler you stay). As for the tactics, I honestly thought that the loss of Robert Cheruiyot to injury would change Kenya’s tactics, and that we’d see a slower first half and brutal second. But that’s just how good Wanjiru was – he decided he’d run sub-2:07 and that no one would match him.